The most recent monthly Case Shiller home price data came out last week, and below we’ve created a number of charts and tables allowing you to see how real estate prices are doing across the US. Case Shiller is one of the few data-sets that allows you to track home price movements in individual cities. The one drawback is that the data is on a two-month lag. 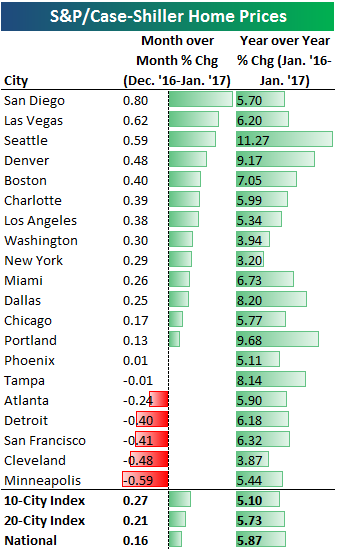 Below is a look at month-over-month and year-over-year changes (%) in home prices for the 20 cities tracked by Case Shiller along with the 10-city and 20-city composite indices as well as their “National” index. 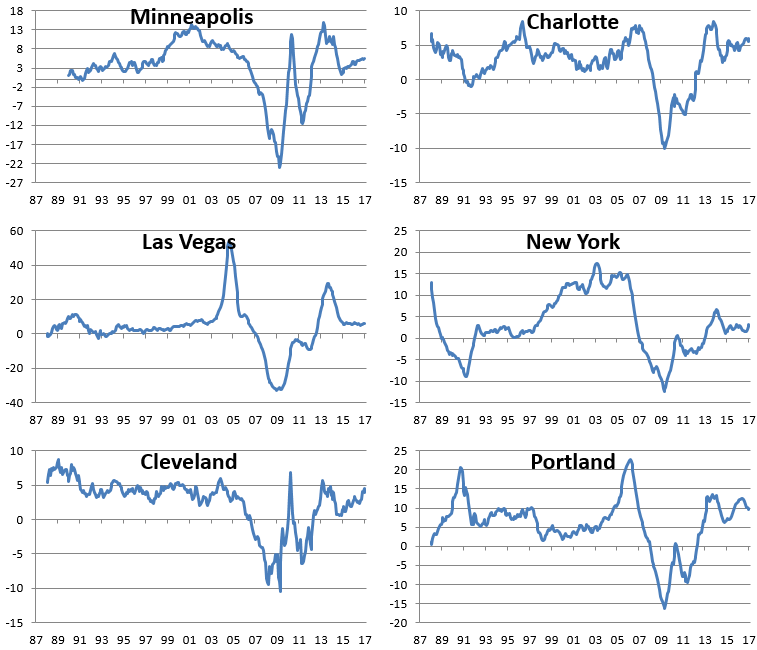 As shown, 14 cities saw month-over-month gains, while six saw declines. 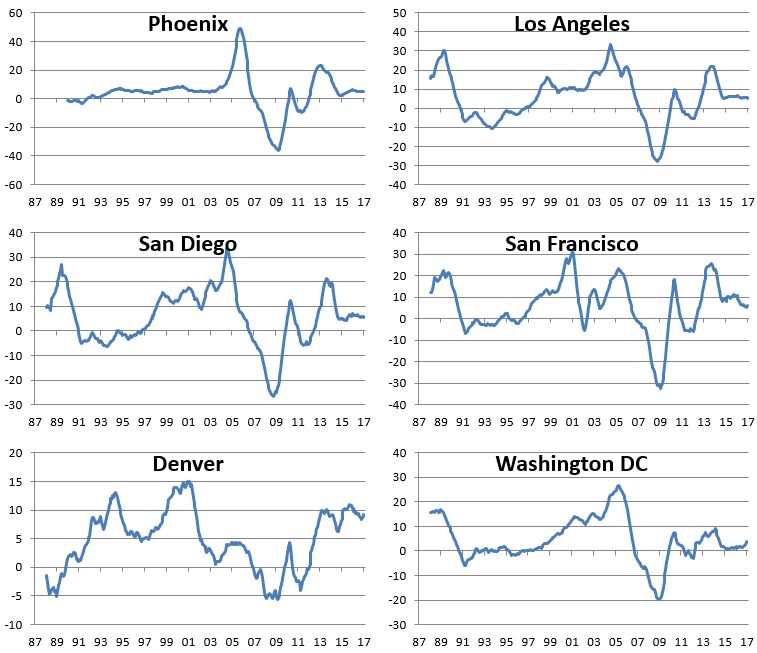 Western cities like San Diego, Las Vegas, Seattle, and Denver saw the biggest month-over-month gains, while Minneapolis, Cleveland, San Francisco, and Detroit saw the biggest month-over-month declines. On a year-over-year basis, Seattle saw the biggest gain at +11.27% — thank you Amazon.com. Portland jumped the second most at +9.68%. New York and Cleveland have seen the smallest year-over-year gains. 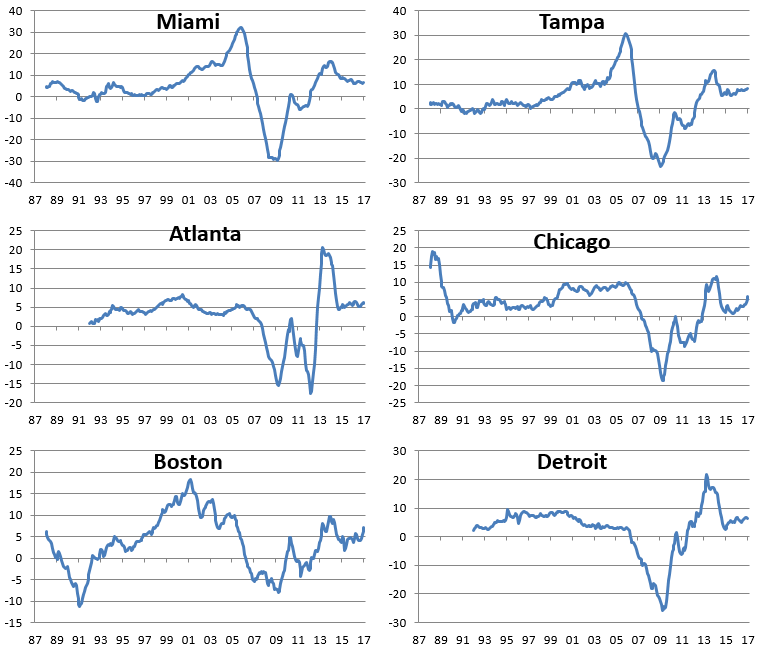 Below is a look at the percentage that each city tracked has bounced off of the lows put in during the housing bust back in 2009/2010. 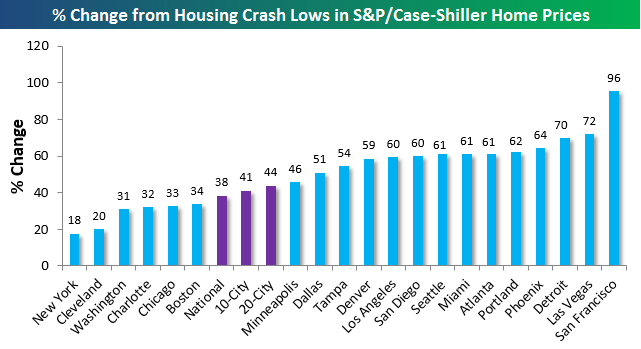 As shown, San Francisco is up 96% from its lows, while New York is up just 18%. Cleveland is up the second least off its lows at just 20%. Below is a look at where home prices stand now in relation to the highs in price that were put in at the peak of the last housing bubble back in 2005. 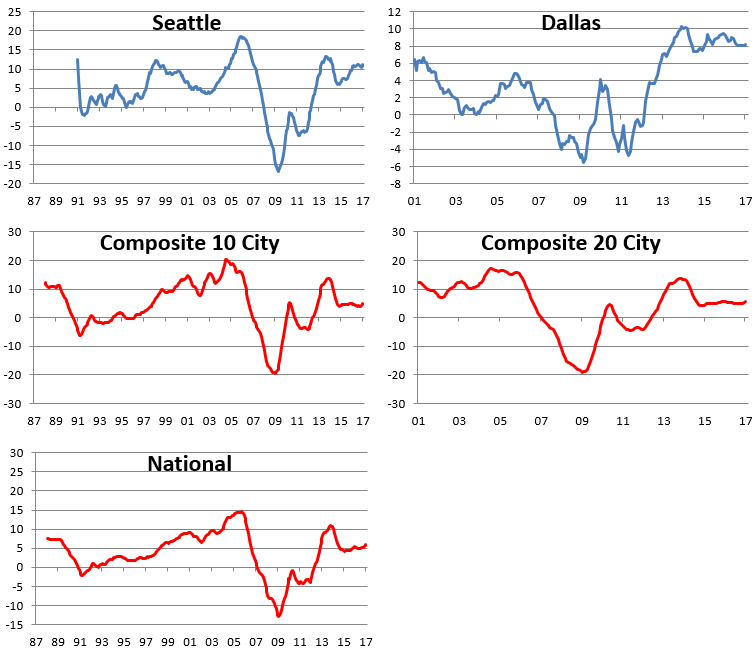 As shown, seven of twenty cities have eclipsed their prior bubble highs, with both Denver and Dallas up more than 30% from their highs back in 2005. The “National” index also has now eclipsed its prior highs, which is a pretty significant reading. 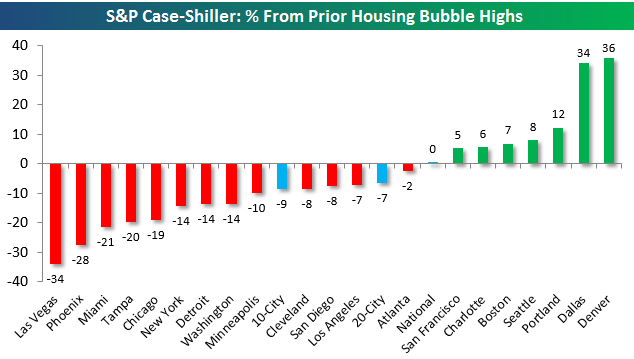 Below we provide charts showing the year-over year percentage change for each city going back as far as the Case Shiller data goes. In most instances the data goes back to 1987, but some cities only have data going back to 2001 or so. You’ll notice when looking through the charts that year-over-year gains are slowly drifting lower. So home prices are still rising, but not by nearly as much as they were just a couple of years ago. San Francisco was posting year-over-year gains of more than 20% back in 2013 and 2014, but in January, home prices in San Fran were up just 6.32% year-over-year. In terms of trend, cities like Chicago, Boston, and Cleveland are the only ones that have seen a bump up in their YoY readings recently.